Listed below are the 64 men who served in the Civil War from the town of Fayston. Henry G Backus, William E Backus, John Baird, Lewis Bettis, Charles D Billinss, Mathew Blair, George Boyce, Nelson G Boyce, Anson O Brigham, Francis E Buck, Thomas Bradley, Chauncey Carpenter, John J Chase, Luther Chase, Mark Chase, Asa E Corliss, Charles B Corliss, Benn E Chaffee, Samuel J Dana, Charl Dana, Charles O Bike, Sie Colby, Eli Gilson, William W Green, Philip Gross, Lester H Harris, Royal S Haskins, Robert Hoffman, John H Hunter, William J Hopkins, John J Hern, Randall Hubbard, Charles C Ingalls, John W Ingalls, Benjamin B Johnson, Stephen Johnson, William H Johnson, John Kane, Frederick Kleinke, Myron Mansfield, Calvin B Marble, George L Marble, Thomas Maxwell, Zibah McAllister, Cornelius McMullan, Allen Mehuron, Heman A Moore, Lafayette Moore, Levi Nelson, William Nelson, John W Palmer, Nelson Parry, Daniel Posnett, Warren C Porter, Winfield S Rich, Judson W Richardson, Reuben Richardson, George Somerville, William Strong, Nichols Schmidt, Nathan Thayer, John S Templeton, James Williamston, William G Williams. 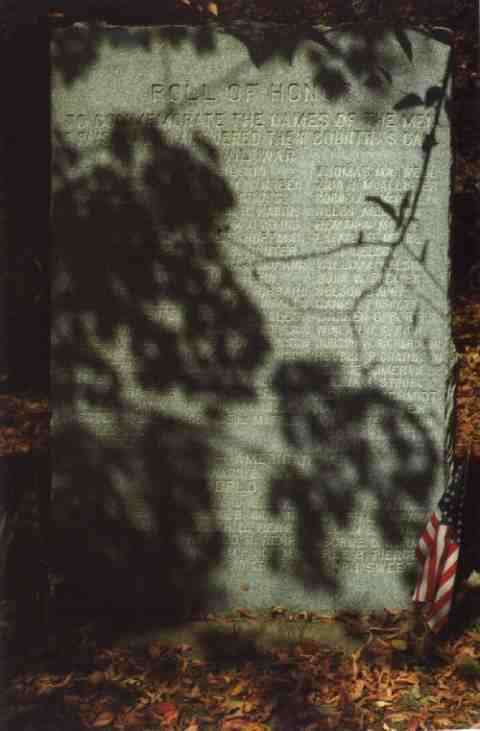 Monument is in North Fayston Cemetery. Courtesy of Peter Flood, great-grandson of 1st Lieutenant, 1st Vermont Cavalry.